There is a major problem on internet discussion forums on the understanding of cancer. Some people say cancer as a general term but it is not a single disease we are dealing with. So let me clarify the meaning of cancer..
Cancer came from word "carcinoma". Cancer is not a single disease it is a generalised/ generic term used for multiple disease types. To simplify.. each organ in human body is made of a group cells with unique morphology and functional characteristics. As per nature each cell has definite life span. They are supposed to die after sometime. However, some of these group of cells has tendency to break the law of nature, go rogue and continue to multiply uncontrollably. This leads to formation of tumor like structures protruding out from the organs which we call cancer for e.g. Brain tumor, pancreatic tumor, breast tumor/ cancer, head and neck tumors and others. Please note that all cancers can be tumours but vice versa is not true. There are certain type of cancers where we don't see tumor formation for example Leukemia (blood cancer), stomach ulcers, skin cancer and others. 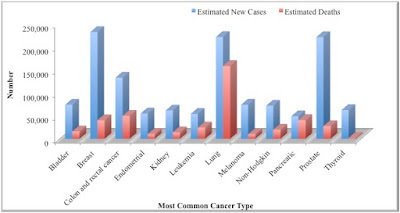 It is important to note that each cancer type has its unique symptoms. Most common types of cancer, incidence rate and their death toll in America are discussed in detail by National Cancer Institute (NCI). Fever due to unknown reason. Severe chronic episodes of pain that does not go away. We do not have single cure for cancer. But we do have relatively good therapies for it, which may or may not give favourable treatment. There are obvious reports which says that the same cancer from two different patients may behave differently to the same therapeutic regime. This mainly happens due to complex evolutionary advantage to cancer cells. 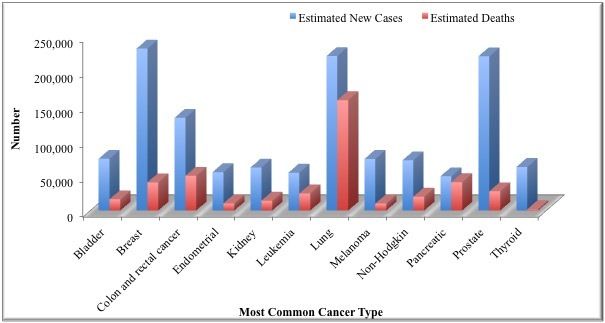 Commonly used diagnostic methods prescribed by American cancer society is given below. You can get more details on each tests by clicking on each cancer type. We have discussed more information on how ageing and its correlation with cancer. We are constantly working towards finding new ways of fighting these cancer types. Newest way is by personalised medicine. Pathway pharmaceuticals provides newer ways of diagnosis of cancer conditions please check here.